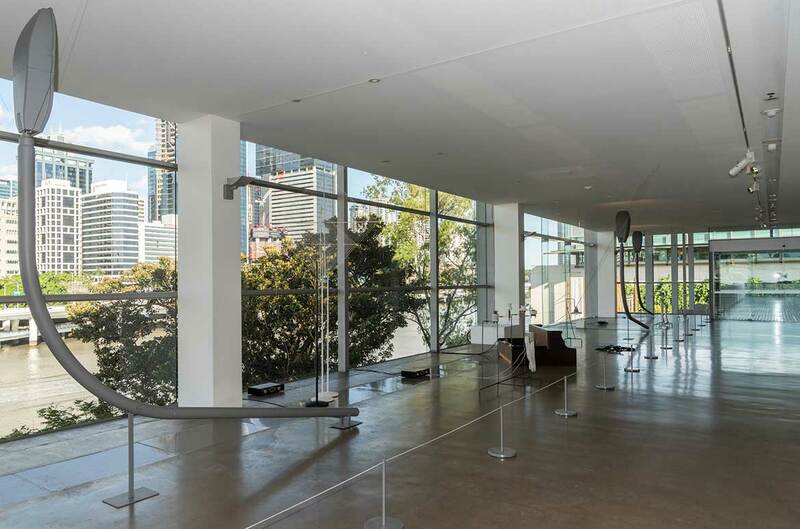 The sober colour and aural palette of Yuko Mohri’s contemplative sound installation Breath or echo blends quietly with the architecture and landscape of the Gallery of Modern Art (GOMA) and Brisbane city, writes local sound artist Luke Jaaniste. Breath or echo: to be the source of utterance and life (a breath), or to be merely a reflection of what was generated elsewhere (an echo). Shall we read this as a question? Is art, and all cultural artifice, a breath of fresh air, or an echo of it? Either way, both die out. Organisms eventually stop breathing (including you and me) and echoes dissipate. Everything decays. 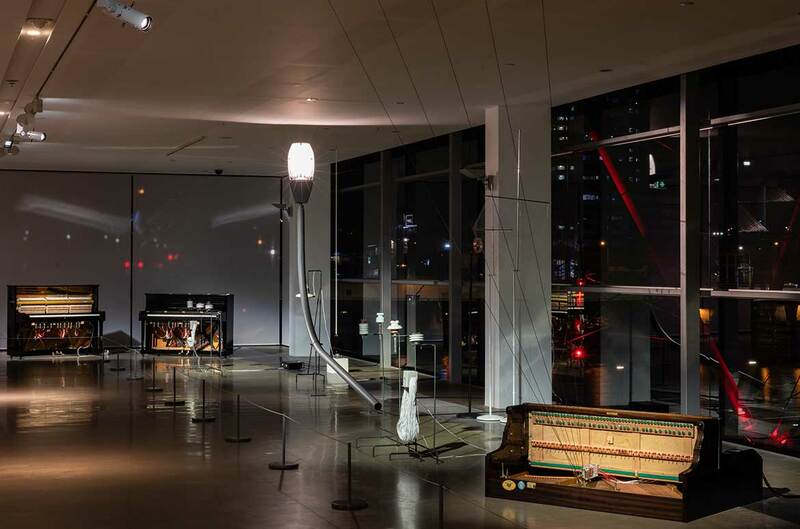 For ‘The 9th Asia Pacific Triennial of Contemporary Art’ (APT9), the work has been re-situated in GOMA’s River Lounge, continuing the connection between sound art and this area of the building.4 What we experience upon entering the space is a series of musical and industrial objects and electronic gadgets spread across the entire panorama of the windowed platform that overlooks the Brisbane cityscape. Alongside the sounds and sound-objects, light bulbs flicker from three of Mohri’s trademark street lamps (sourced locally for this installation) that have been placed laterally on the floor. Linger long enough and you will hear four interweaving layers of sounds. The most constant layer, which frequently comes and goes, is a high-pitched metallic bell-like shimmer, made from metal washers, discs and sticks knocking against old industrial electrical fittings, electromagnets and concrete blocks. Occasionally, we also hear a low guttural sound emerging from a piano laid with its back on the floor; five strings attached to wires stretch up to the ceiling, and automated units fibrillate the strings. 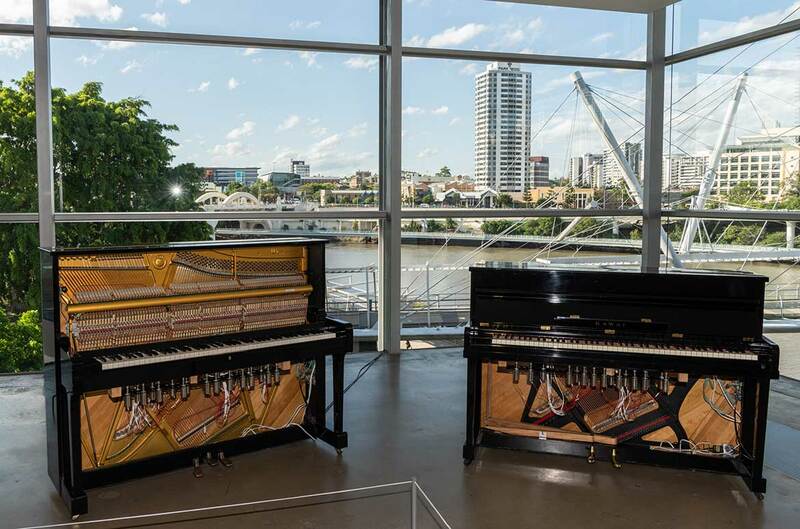 Accompanying these industrial sounds is a slow, strange melodic duet between two upright pianos, which have been modified to play automatically via attached electronics, like modern-day player pianos. 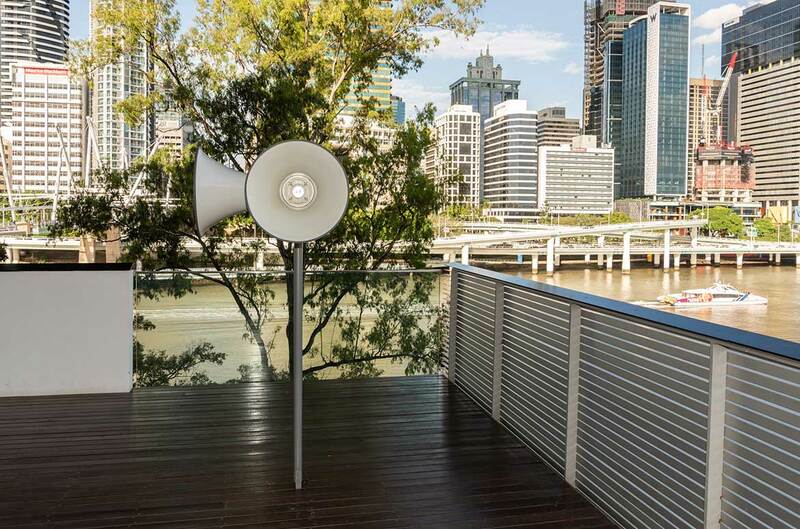 The fourth layer, a recitation of spoken-word poetry, emanates from lonely loudspeakers that can only be heard by stepping outside to the deck overlooking the nearby State Library of Queensland. 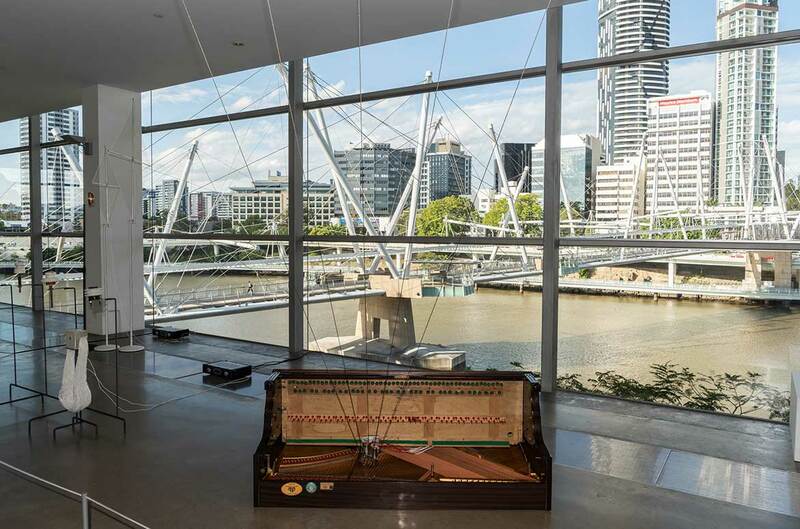 The work’s sober colour and aural palette blends quietly with the concrete, glass and white walls of GOMA, and the white concrete and metal pylons, rails and roads of the Kurilpa Bridge and Riverside Expressway that skirt the city of Brisbane and which form a real-time living backdrop. The effect is like a fractured kaleidoscope of memories, something contemplative, distilled and even lonely, producing what has been described as ‘improvised ecosystems’:5 an auditory and object-laden landscape punctuates the air with minimal, occasional, accidental, random incursions. Such sounds are reminiscent of the aural activity of cityscapes — random accumulations of noise that can be musical if we wish to listen to it in this way, as John Cage and many other ambient and environmental experimentalists have encouraged us to do. Breath or Echo is a collaborative work, and Mohri invited the input of a range of other artists: piano music by Ryuichi Sakamoto, poetry by Bikky Sunazawa, poetry recitation by Camille Norment, along with programming by Yuya Ito and lighting engineering by Keiji Ohba (Ryu). Nonetheless, Breath or Echo bears all the hallmark qualities of Mohri’s style, evident in her growing body of installations, including Moré Moré (Leaky): Variations 2017–, Parade 2011–, Divertimento for Child’s Room 2016– and Calls 2013–, which have been commissioned by and exhibited in major galleries in Asia, Europe and New York.6 Mohri’s artworks have a beginning date but remain ongoing projects; across multiple exhibitions and versions they appear and shift in configuration, operating in a ‘site-responsive’ space somewhere between touring and sitespecific realisation. In creating her installations with simple, elemental components and basic gestures, Mohri’s work speaks to and intersects with a whole range of cultural trends and art-historical tropes: found objects and readymades, immersive installation and soundscapes, automated music and kinetic sculpture, collage and assemblage, and the materialisation of ephemeral media. 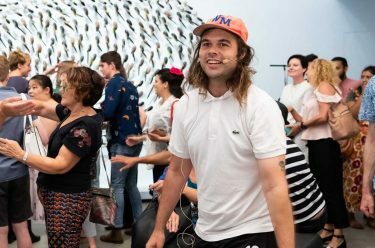 Luke Jaaniste is a sonic, spatial and social artist. 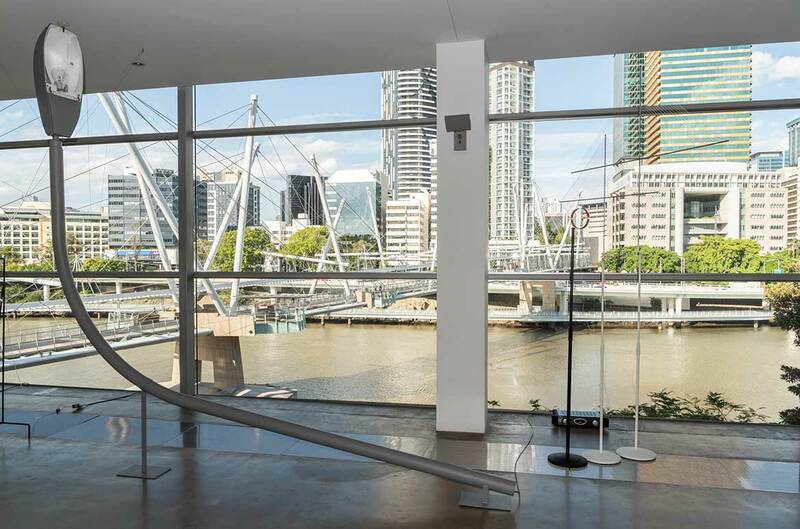 As one half of Super Critical Mass (with Julian Day), he was a participating artist in APT8. He is trained in music composition, has completed a PhD in ambient experience and works as a solo and collaborative artist and performer. 1 Artist statement, Yuko Mohri, <http://mohrizm.net/works/breathor- echo>, viewed December 2018. 2 Walter Benjamin, On the Concept of History, trans. Dennis Redmond, Global Rights Books, 2001; first published as Über den Begriff der Geschichte, 1940, <https://www.globalrights.info/2016/09/ the-concept-of-history-walter-benjamin-download-book>, viewed December 2018. 3 Artist statement, Yuko Mohri, <http://mohrizm.net/works/breath-orecho>, viewed December 2018. 5 Jyni Ong, ‘Artist Yuko Mohri creates improvised ecosystems through found objects’, It’s Nice That, 15 October 2018, <https://www.itsnicethat.com/articles/yuko-mohri-improvised-ecosystemsart-151018>, viewed December 2018. In this spoken-word performance created specifically for APT9, Kathy Jetñil-Kijiner uses the symbolism of the weaving process and weaving circle to explore how women’s roles and identity are shaped by Marshallese culture, the nuclear legacy, and a climate-threatened future. It draws inspiration from the Japanese dance art form of butoh to capture the metamorphic influence of the nuclear legacy on the bodies of women. The work is a weaving of words and movement, each strand connecting local wisdom with discourses of global relevance, opening the weaving circle to a new audience in APT9 – a circle defined by the open flow of learning, creativity, and a spirit of humble resilience that connects and characterises weavers of the Marshall Islands. Read more about Yuko Mohri and Kathy Jetñil-Kijiner in The 9th Asia Pacific Triennial of Contemporary Art available online or in store. 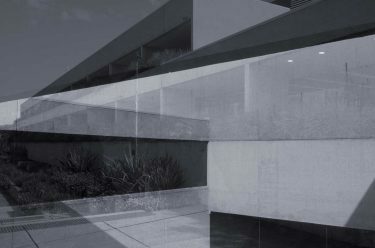 The publication represents an important and lasting document of the current artistic landscape of Australia, Asia and the Pacific.